Set amidst the unequalled beauty of a Costa Rican forest wilderness is the longest, most exhilarating canopy tour in the world. Traversing majestic mountain ridges and valleys, soaring high above multiple ravines, with breathtaking vistas of rivers, waterfalls and the Pacific Ocean. Comprised of 21 exhilarating runs, a stopover at the waterfall and river pools, the ultimate stage emerges from the serene forest, crosses high above beautiful River Nosara and sails directly into a disco-bar on the top floor of a five story architectural wonder. Suitable for nature lovers, adventurers, families and all who wish to experience the ultimate canopy tour adventure; Miss Sky Canopy promises to be the experience of a lifetime. Email us today for more information or to book a reservation at info@missskycanopytour.com. * Total length is over 11 km. * Miss Sky Canopy affords 100% natural vistas and 0% human presence, located within a pristine 2500 acre forest reserve that is situated in a coastal mountain range just 4 miles\10 minutes from Costa Rica’s finest Pacific Coast beaches, including the famed Ostional turtle nesting refuge. 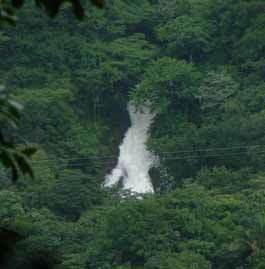 * A stop at the largest waterfall in the region, with a network of river pools and endless forest trails to observe nature and listen to the chorus of howler monkeys is all exclusive to the canopy tour participants.